This report provides forecast and analysis of the global avocado oil market. It provides historical data of 2013 along with estimated data of 2018, and forecast data up to 2026 in terms of revenue (US$ Mn) and volume (metric tons). The report also includes macroeconomic indicators along with an outlook on avocado oil for global market. It includes drivers and restraints of the global avocado oil market and their impact on each region during the forecast period. The report also comprises the study of current issues with consumers and opportunities for avocado oil. It also includes value chain analysis. In order to provide users of this report with comprehensive view of the market, we have included detailed competitiveness analysis and avocado oil market key players and strategy overview. The dashboard provides detailed comparison of avocado oil manufacturers on parameters such as total revenue, product offerings, and key strategy. The study encompasses avocado oil market attractiveness analysis by type, end use, avocado varieties and region. 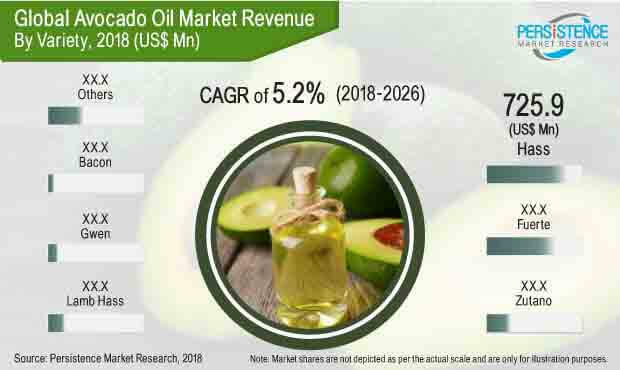 The report includes avocado oil market company profiles and the revenue generated from the companies across North America, Latin America, Europe, Asia Pacific and Middle East & Africa. For the estimation of market size, some of the key data points collected for modeling approach include total acreage of avocados planted, average yield, total production, amount consumed directly v/s amount used for processing into derivatives such as guacamole, avocado puree and avocado oil, etc. This was followed by evaluating the average yield of avocado oil from avocado processing. This data was cross-referenced with the market share of avocado oil among edible oils in top consuming regions and benchmarked for other regions. All key end use segments have been considered and potential applications have been estimated on the basis of secondary sources and feedback from primary respondents. Regional average prices were obtained through quotes from numerous avocado oil producers, exporters, and distributors. The growth rate of the avocado oil market has been analyzed considering factors such as growth in the specialty oils sector and the growth in average per capita expenditure. Company-level market share has been derived on the basis of usage of avocado oil in respective end use applications. The market has been forecast based on constant currency rates. Given the characteristics of the market, PMR triangulated the data based on supply side, demand side, and dynamics of the global avocado oil market. However, quantifying the market across the abovementioned segments is more a matter of quantifying expectations and identifying opportunities rather than rationalizing them after the forecast has been completed. A number of primary and secondary sources were consulted during the course of the study. Secondary sources include Factiva, and Hoovers, and company annual reports and publications. Another key feature of this report is analysis of the global avocado oil market and the corresponding revenue forecast in terms of absolute dollar opportunity. This is usually overlooked while forecasting the market. However, absolute dollar opportunity is critical in assessing the level of opportunity that a provider can look to achieve, as well as to identify potential resources from a sales perspective in the global avocado oil market. To understand key segments in terms of their growth and performance in the global avocado oil market, Persistence Market Research has also presented a market attractiveness index. The resulting index should help providers identify existing market opportunities in the global avocado oil market. The report provides detailed competitive and company profiles of key participants operating in the global avocado oil market. Some of the major companies operating in the global avocado oil market are Spectrum Organics Products, LLC (Hain Celestial Group, Inc.), Sesajal S.A de C.V., Cibaria International, Crofts Ltd, Tron Hermanos, S.A. de C.V., Aconcagua Oil & Extract SA, The Village Press, Westfalia Fruit (Pty) Ltd, CalPure Foods, Inc., Avocado Health Limited, La Tourangelle, Inc., Mevi Avocados, Inc., Madana Inc., Proteco Gold Pty Ltd, Bella Vado, Inc and Olivado USA among others. Avocado (Persea americana) is a tropical fruit, mainly native to South America, which is now widely cultivated in other tropical and few Mediterranean regions of the world as the demand rises. This fruit contains 5-30% oil, depending upon the species/variety, and it is extracted by the cold pressing method or by solvent extraction. Hass and Fuerte are the most commonly used varieties for the extraction of avocado oil. Other avocado varieties include Reed, Bacon, and other regional varieties. As avocado oil’s nutrient profile boasts of higher content of beneficial fatty acids, the health-conscious population, especially those who are battling obesity problems become the major consumer base of avocado oil. Avocado oil is positioned in the market as an immediate healthier alternative to olive oil, and an alternative to other cooking and dressing oils. Also, the short-comings of olive oil such as an unwanted odor and flavor it leaves in food, makes consumers opt for other healthy and flavorful oils such as avocado oil, which is also a key factor driving the avocado oil market growth. Changes in consumer buying patterns such as first acknowledging the nutrient composition of a food product and an inclination towards natural and healthier ingredients acts as a major driving force for the avocado oil market. In terms of value, the global avocado oil market is expected to represent an incremental opportunity of 430.8 Mn by 2018 end over 2017. By product type, the extra virgin oil segment market is expected to register a CAGR of 6.1% in the avocado oil market. The Middle East & Africa region is expected to register relatively low growth in the avocado oil market, due to lower per capita expenditure on gourmet and specialty products. Competitive products for avocado oil are chia seed oil, olive oil, hemp oil, and other alternative oils that are produced from healthy sources. These oils carry unique benefits of their own, and most of them are cheaper to produce, as they are produced from industrial by-products, unlike avocado oil, which is produced from fruit flesh, resulting in higher costs. This is expected to challenge the avocado oil market over the forecast period since consumers have a number of alternative cheaper products easily available on retail shelves. There has been an upsurge in the popularity of Mexican and Pan-Latin flavors, making them part of a mainstream culinary culture. As a country’s food culture is highly influenced by its neighbors, nearly 73% of U.S. consumers use Mexican food and ingredients. Avocado oil has been one of the preferred ingredients in Mexican and Hispanic food items. There has been a significant volume of avocados produced that are wasted to rot or fed to livestock. The short shelf-life of avocados makes them highly unsuitable for export and these avocados present a considerable potential for the local farmers to convert them to high value-added products such as avocado oil. By establishing partnerships directly with the farms to procure avocado feedstock or setting up processing capability at or near farms is likely to mitigate the risk of loss due to wastage, in addition to providing an alternative revenue stream to avocado farmers through the processing into avocado oil. On the basis of region, the market in Latin America is anticipated to dominate the global avocado oil market in 2018. Europe is expected to gain significant market share in revenue terms by 2026 end. Moreover, countries like U.K., Belgium, and the Netherlands are projected to exhibit significant growth during the forecast period in the avocado oil market. The avocado oil market in Asia Pacific is also expected to gain traction as food processing companies establish their manufacturing base in this region and incorporate avocado oil as an ingredient in processed and packaged food products. Tron Hermanos, S.A. de C.V.